Please accept our best wishes and the blessings of Lord Shree Krishna. 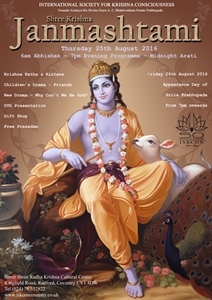 We cordially invite you to celebrate with us with pomp and ceremony the birth of Shree Krishna, the darling not only of Yashoda-Maiya, but also of all of us. Lord Krishna as the Supreme God is unborn, yet just to attract our hearts and minds, He decides to take birth as the sweetest child in the whole of the creation. Please share with us the splendour of His love and mercy, which He gives unconditionally to all. Join us and make it a night to remember for the rest of your lives. We find that if we involve our children in such celebrations, they become attracted to the Vedic culture and religion at an early age by witnessing dramas, kirtans, the Deities on a beautifully decorated Altar, and the worship of Shree Krishna. Therefore, together with the normal worldly education that they are pursuing, please help them to familiarize their innocent lives to the Spiritual Truth, which will prepare them to cope with the challenges of life awaiting them. Of course, they and everyone else will love the feast that will be served during the celebration. Please see the invitation which indicates the times for the morning abhishek (bathing) of our Deities Sachinandan and Nitaichand, and the evening programme leading up to the midnight arati. We humbly request your kind support to help us meet the expenses of this festival. So please donate generously using the appeal form on the back of this letter. And don’t forget to encourage your friends and relatives to also come to the festival. All welcome. Looking forward to serving you on the 25th August 2016. Shree Bal-Krishna-Lal ki jay!